Before you apply pharmacy notification, you need to buy rm335 digital cert usb token. And you need to pay rm50 to buy a pharmacy notification for a product. So total u need to pay is rm385. 1) Pay money to an agent and ask the agent apply pharmacy notification for you. The agent's email address is consultants.cosmetics.mn@gmail.com I not sure how much service fee that she will charge you, maybe rm150 or rm200. 2) Do it yourself, you are independence person, you want to do it yourself, you don't need waste money to hire any agent. You must have a business license before you apply pharmacy notification. 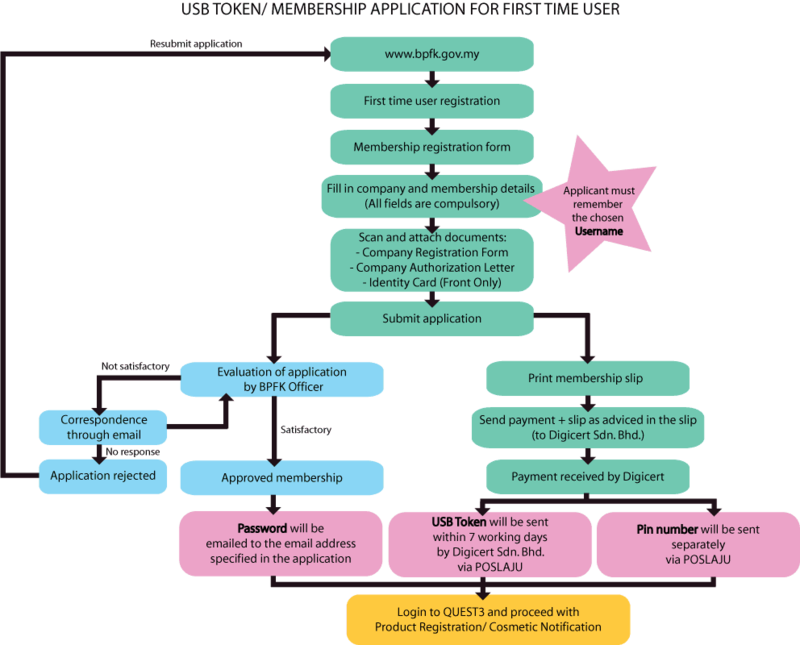 You can get your business license at about rm70 by following the steps here : http://ye5.blogspot.com/2012/06/online-register-business-in-malaysia.html. - Go to http://portal.bpfk.gov.my/ click QUEST3. - Click Registration at bottom of page. - Type your business license registration number onto the field of "Company Registration No". - Upload your business license file. --> in front of your ic. ---> the last page and sign your signature on that it. ---> the front of your ic. ---> your company authorisation letter. - Bring this 4 pages and RM340 cash to a nearest post office. - Walk to the counter in post office and tell them u want to send money by Postal Order or Money Order. (I guess Postal Order is better because fee of Postal Order is rm0.5 only but Money Order is rm2. Moreover post office cannot key in full name of bpfk to computer because the name is too long, so if they didn't typed in last word of the name "Kebangsaan" onto computer, BPFK will not be able to withdraw the money out by the voucher of Money Order thus will delay to process your pharmacy notification). - The counter will give u a money order form. - Filling the form with rm335 amount and recipient address. - Pass the form and rm335 cash to the counter. - the counter will charge u rm2 fee of money order. - The counter will give u 2 receipts of money order. - Tell the counter that you want post the 4 pages and the big size receipt of money order together by post express. - The counter will ask u pay rm5 for the post express. - the counter give u a big post express envelope. - You put the 4 pages and the big size receipt into the big post express envelope and seal it. - Pass the envelope to the counter. More instruction at : http://www.cornerstone-msc.net/bpfk/aeimages//File/New_Membership_Q3_Registration.pdf. 1- letter of authorization from manufacturer allow you resell the product. 3- Company info : Company Name, business license number / business registration number, company address, phone, fax. - If you didn't receive your login password through email within 3 days after u send the money, you must email bpfk company (not digital cert company) to ask why u didn't receive the email yet. - 7 days later u will receive the usb token by poslaju. (But for me, I receive the usb token 16 days later after i have paid the money. - insert the usb token to your computer. - Click the words below "Login". - Login with your username and password. More instructions at : http://portal.bpfk.gov.my/aeimages//File/QUEST3/Guide_to_QUEST3_Login.pdf. - Click COSMETIC NOTIFICATION on left menu. ---> manufacturer company (click "Not Listed" then register it). ---> assemble (click "Not Listed" then register it). ---> importer (click "Not Listed" then register it). ---> ingredients (click "Not Listed" then register it). - After all fields get approved, then click "search" then select it then click "add". (if not yet approve, click "not listed", then copy email address from "To:" field and email them to ask the proceed it faster). ---> Notification Payment (must print out 3 copies of payment voucher and submit all the 3 copies with rm50 Postal Order / Money Order receipt to bpfk by Post Express. If you accidentally closed the window of payment voucher without printing it, you click "Notification Status" from left menu, then copy "Product Reference Number" then click "Notification Payment History" then search by "Reference Number", then scroll the scrollbar at bottom to right then u will see the payment voucher link, click it and print it out). - 2 or 3 days after you have made payment, go to post office malaysia website check the post express tracking see if success delivered to recipients already or not, you can email or phone calling post office malaysia to confirm it if tracking website information has something wrong. After confirm the delivery successful, go login into your BPFK website account, click "Notification Status", if you see still "Payment Pending" 2 or 3 days after you have made payment, you should phone calling bpfk financial department 03-788354005420 / 5421 / 5423 ask them whether or not they have receive your payment vouchers and rm50 Postal Order / Money Order. If they answer didn't receive yet, then you should ask them to check with mailing department. - After 2 days, login into your BPFK website account. Click "COSMETIC NOTIFICATION" from left menu. Click the product name. Print out the notification. - Bring the notification to Kastam office at 10.30a.m morning, don't be late than 11a.m because pharmacy department will close at 11a.m. You need to submit the notification to pharmacy agent who sit in Kastam's office. Then the pharmacy agent will chop the blue words on your parcel document. Chop red words mean not yet get the pharmacy notification. Chop blue words mean having pharmacy notification already. - Bring the document to Kastam office and then Kastam will release your parcel to u. Then finally you can take your parcel go home! Cheer! - I forget to include the 3 copies of payment vouchers t the rm50 money order receipt Post Express envelope. I phone calling bpfk, they asked me just post the 3 payment vouchers to them is okay. So I wasted another rm3 to post the 3 payment vouchers by Post Express. Then after 3 days I receive the rm50 money order receipt. BPFK told me must not separate post the 3 payment vouchers and rm50 money order receipt. So I need to waste time print another 3 copies of payment vouchers and waste another rm3 to post them together by Post Express. It is wasting 8 days and rm6 and 3 A4 paper and printer ink. Sad case. - If you use poslaju to post the money order to them, just because poslaju don't post parcel to address start with P.O.Box, so please write recipient's address as 36, Jalan Universiti, Seksyen 13, 46200 Petaling Jaya, Selangor. hi Zac, Thanks for the info. By the way, do we need to submit the formulation of products in percentage? Hihi, May i know if we are using bank draft to make the payment, what information (such like the benefiary name) should we pass to bank to make the bank draft? If using wang post? Because I never use wang post before. Thanks for your advice first. @5, believe me, go post office use wang post is a lot easier. Just need name and address of the sender and receiver. U can ask the post office counter teach u how to do it. May i have another questions? 1.Why they need 3 copies of payment voucher to be sent together with the bank draft/wang pos? 2.We must have to go to Kastam after get approval? 1. No sure. Maybe they need it for 3 different department. 2. Depend on the courier. For DHL, just email farmasi notification to dhl, then dhl will settle it and send it to ur house and get cash from u if kastam tax them. For other courier, kastam will send u a letter to ask u go to kastam office to make clearance. Bring famasi notification and payment receipt of product purchasing such as paypal / or invoice that given by seller. Hi zac..my products have five different item but all is from same brand.isn't need apply five x Rm50 pharmacy notification or just all total in one pharmacy notification ? Hi thank you so much for the detail. But if I want to import every month Izzit mean I need to apply every month? If one order have many different product then what should I do? no. Just apply 1 time. Expired date is 2 years. hi, i only need to send the mail( manufacture, assemble, importer and ingredient)at once?after i click all as not listed. can you provide the sample letter of authorization from manufacturer allow you resell the product?coz the manufacture company from taiwan so they aren't good at writing, thanks. @Leo Tan. What by mail? by bpfk website. Taiwan people is not good in writing and but u are Malaysian. 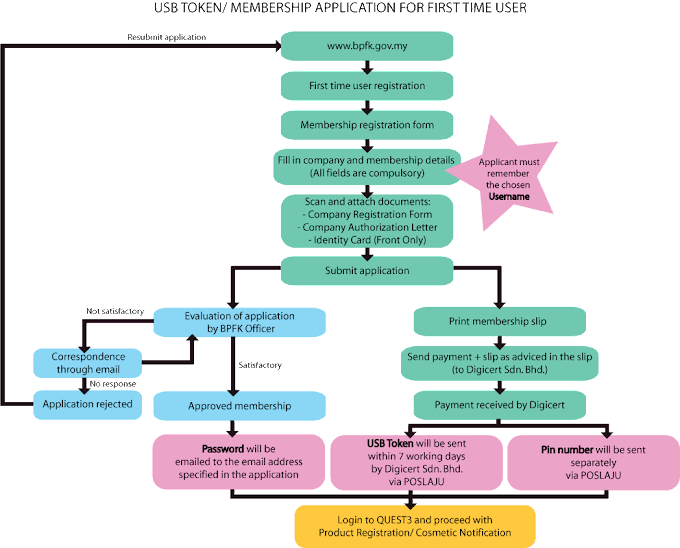 Hi there, I have read your interesting sharing of How to Apply For Pharmacy Notification for Cosmetic Products :) I would like to check with you must the authorization letter given from the Manufacturer? As I am purchasing from the wholesaler not manufacturer :( Nowadays they have this "Authorization Letter from Product Owner", do you know what is this? Appreciate if you could assist on this matter, many thanks! Hi Ang...Do we need to have the percentage of each ingredient content?.. or jus the name of ingredients will do? Thank you so much for this very useful and helpful article!! Ya, i got the same question, I'm also purchasing from the wholesaler/agent, not the manufacturer, they need the authorization letter from product owner, is it the same i get the agent/wholesaler to issue this will do?